Did you have a good Thanksgiving with the family? Of course you didn’t; you had it with the family. Let’s try it out: Did you have a good Thanksgiving while being tortured sadistically? See how the words are different, but their meaning hasn’t changed. Are you nursing a headache today because getting through Thanksgiving with the family means more Wild Turkey than actual turkey? Wild Turkey: helping you survive family get-togethers since 1869. Did your crazy uncle pull out his pictures of what he claims to be a Bigfoot, but what looks suspiciously like the stump in his backyard. Did your vegan cousin punctuate the Thanksgiving Day prayer by loudly proclaiming that meat is murder? 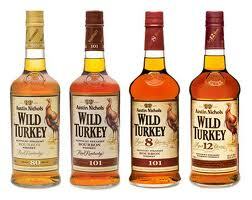 Wild Turkey: helping provide your Thanksgiving dinner since 1869. Did your crazy uncle once again regale you with story of how he once shot a unicorn, but by the time he got to it, it had turned back into his neighbor’s goat? Did you cousin, the serial dater, arrive with a man who was a definite upgrade from previous years: he did have a face tattoo and prosthetic fangs, but at least he didn’t have a hook for a hand? Did an argument break out over whether the term inbred is pejorative? Did the argument rapidly escalate when somebody looked up the word pejorative? Did the argument result in multiple stabbings, limited gun-play, and one injury from a crossbow? Do you now have a wound on your forehead that you will describe in the future as the scar of Thanksgiving 2017? Did your aunt, the mean one, bring her infamous three bean salad? Did the three bean salad taste like a monkey had peed on a pile of death? Did everyone suffer through the three bean salad because they’re too afraid of her to comment? Did your drunken uncle attempt to carve the turkey (or opossum, groundhog, warthog, whatever) and sever his pinky finger…again? Did your uncle, the volunteer fireman who thinks he’s a doctor because he’s had first aid training, attempt to reattach the finger using liquor as an antiseptic and fishing line as sutures? Was the phrase, “I’ve never seen so much blood” uttered multiple times during the procedure? Wild Turkey: aiding your family with ill-advised medical procedures since 1869. Did you promise yourself that you would never again step into this unholy cacophony? Well, at least not until Christmas, or you’ve procured holy water and a crucifix. Wild Turkey is good for numbing the senses, or for cleaning a bayonet wound–both will apply. Got a bit of the Monty python gene going I see… Good satire. MWAHAHAHAHAHAHAHAHA😺😺😸😸😸😺😸😺😸😺😸😸😸😸! Dude- where do you hide at our family gatherings??? Hehehehe!!! If I wrote about the really amazing stuff I’d probably be sued. What’s more fun than vegans…wait I’m thinking of Vegas. The Holidays always bring out the Best of the Worst People. They’re always there, the holidays just bring them out. I am glad, in Germany it is ONLY Christmas, that is the family-horror … that is bad enough. Ok, let’s be honest – we may not celebrate Thanksgiving big style – but there is always Easter to fear! Easter is fine, the vampires stay underground in the daylight. We had a good Thanksgiving this year (last month, since we’re Canajen, eh?) Any Wild Turkey consumed was recreational, not medicinal. Self-medicating is recreational–at least that’s what I tell myself. 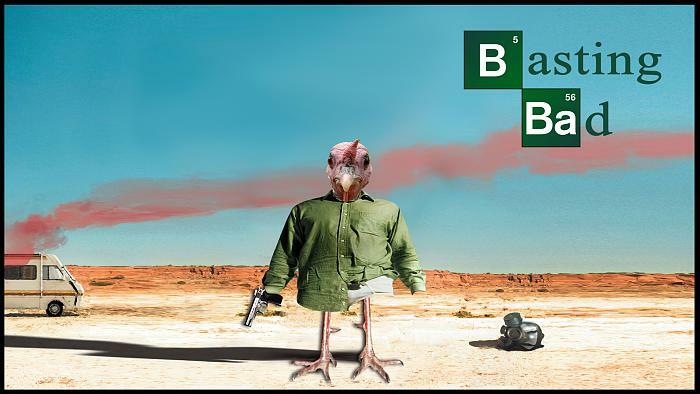 I was always told that the turkey committed suicide. I hope Turkey Day weas a good one for you, idiot! Good/non-lethal it’s all pretty much the same.